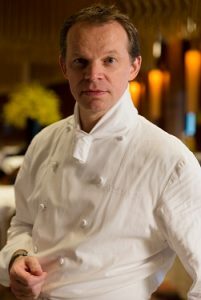 Amber, the two Michelin-starred restaurant helmed by chef Richard Ekkebus at The Landmark Mandarin Oriental, Hong Kong, will close temporarily for renovations. The all-new Amber is expected to open in late Spring 2019. The last day of service will be Sunday, 9 December. To mark the iconic restaurant’s last week of service before the temporary closure, Amber will host A Feast for the Future from 3-9 December. In recognition of Amber’s remarkable success, A Feast for the Future menu showcases 14 signature dishes that have contributed to the restaurant’s lasting culinary legacy with each dish representing a year in Amber’s 14-year journey. From 3-8 Dec, the 14-course tasting menu is priced from HKD 3,488. Guests attending A Feast for the Future on Sunday 9 December have the opportunity to celebrate Amber’s past and preview its exciting future. On the restaurant’s last day of service, guests will enjoy the 14-course tasting menu and also be among the first to experience an all-new eight course menu during Amber’s pre-opening period. As well as witnessing the closing of Amber’s current chapter, a select few will welcome its next phase prior to the reopening. The Feast for the Future dinner on 9 Dec and pre-launch menu is priced from HKD 6,888 and includes a commemorative cocktail designed by Jeff Bell, co-founder of PDT and current titleholder of America’s Best Bartender. Since 2005, Amber has earned a reputation as one of Hong Kong’s leading fine-dining destinations. Over the last 14 years, the award-winning restaurant has hosted dignitaries, celebrities and global gourmands eager to experience Richard Ekkebus’s contemporary menu infused with the freshest, most exclusive and unique Japanese ingredients. As Culinary Director of The Landmark Mandarin Oriental, Richard’s refined style and passion for excellence has guided Amber to the top table of global gastronomy. Committed to pushing culinary boundaries, Amber has welcomed some of the world’s top chefs, from Ferran Adrià and Corey Lee to Virgilio Martinez.